The effective reboot of the Valhalla High School wrestling program appears to be an ongoing success judging by results so far in the 2013-14 season. “We’ve probably doubled the size of the program,” VHS coach Steve Bulette said with a definite mix of optimism and enthusiasm. “We currently have about 80 to 90 percent freshmen and sophomores. We only have three seniors. We’re doing pretty well; we’re just young. 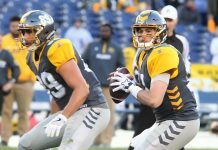 The Norsemen look only to get better in coming seasons. 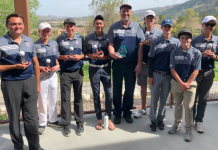 As is, they do have some firepower in their line-up, as demonstrated by an eighth-place team finish in last Saturday’s 25-team South Bay Invitational varsity tournament at Otay Ranch High School. Valhalla advanced four wrestlers to the semifinal round, finishing with one second-place medalist (Trevor Burningham at 163 pounds), one third-place medalist (Nico Gabriel at 173 pounds), one fifth-place medalist (Noah Houston at 173 pounds) and two sixth-place finishers (McKellen Muralt at 109 pounds and Walt Bailey at 155 pounds). Burningham, fresh off a championship title at the Holtville Invitational the previous week, finished 4-1 at the SBI tourney with two pins and one technical fall. He won his opening two matches by pin (35 seconds and 3:20) before recording a 17-1 tech fall in the quarterfinals. Burningham edged Otay Ranch’s Adrian Hernandez, 5-3, in the semifinals to advance to meet Poway’s Chris Jones in the championship round. Jones won by a 5:10 pin to claim the weight class title. Burningham improved to 30-8 on the season — a campaign that still holds much promise for the VHS senior. “I want to have fun and go with the flow, taking it match to match,” he said in handicapping the upcoming post-season competition that starts Feb. 22 with the San Diego Section divisional championships. El Capitan (10th place), West Hills (11th place), Steele Canyon (14th place) and Santana (20th place) also competed in last weekend’s South Bay Invitational. Steele Canyon’s J.R. Fischer joined Valhalla’s Burningham with a runner-up finish in his 198-pound weight class after dropping a narrow 3-2 decision to Southwest El Centro’s Steven Villanueva in the finals. West Hills’ Mavrick Mooneyham finished third at 116 pounds following a win by 13-0 major decision against Hilltop’s Giany Barbosa. Also for the Wolf Pack, Tristan Bonventre (129) and Nicholas Rivinius (155) both placed fifth. El Capitan had three medalists: Robert Kennedy (third, 185), Carlos Alexander (fourth, 198) and Cameron Gritz (fifth, 141). Steele Canyon had one other medalist: Brett Maynard (fifth, 123). 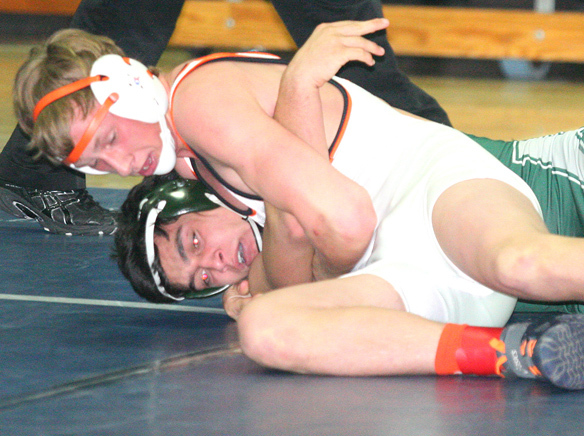 Helix recorded a runner-up team finish at the Highlander Invitational on Feb. 1 while Monte Vista placed fourth. East County individual champions included West Hills’ Mooneyham (113) and Mountain Empire’s Troy Clark (195). Recording runner-up finishes were Helix’s Walter Todd (160), Mozi Schwalger (170), Jerome David (182) and Mike Fajardo (195) as well as Monte Vista’s Alex Garcia (132) and Brandon Rosete (220). Helix place-winners also included Jonathan Honda (fourth, 113), Miles Baack (fourth, 120), Salvador Carrillo (third, 132), Mike Aliyev (fourth, 145), Damian Rodriguez (fifth, 152), Marq Corona (fifth, 220), D’Rell Gist (sixth, 138), Greg Landeros (sixth, 145), Demetrius Glover (sixth, 285), Spencer Pham (seventh, 106) and Andrew Silva (seventh, 182). Monte Vista place-winners also included Mario Hernandez (third, 126), Elija Pratt (fourth, 106), Philip Campos (fourth, 170), Andres Lopez (fifth, 113), David Diaz (fourth, 138), Jesus Calderon (fifth, 132) and Alan Elia (fifth, 285). Very well written post. It will be valuable to anybody who utilizes it, including me. remarkable chance to check tips from this web site. week to study the newest tips you have. And definitely, I’m just actually fascinated concerning the excellent principles served by you. Thanks a lot for providing individuals with an extremely remarkable chance to check tips from this web site. visit your blog the equivalent of three times in one week to study the newest tips you have. And definitely, I’m just actually fascinated concerning the excellent principles served by you.